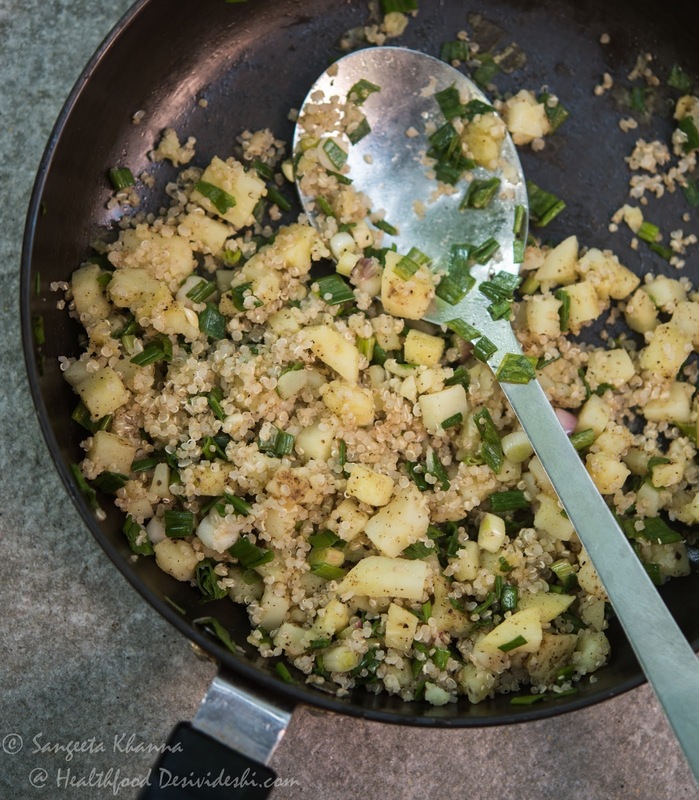 How our favourite potato and spring onion combination will pair with quinoa? I was a bit concerned when I wanted to use the first batch of spring onions I got this season with quinoa. I haven't been cooking myself these days as my fingers are still painful with stiff joints due to a recent Chikungunya bout, so the recipe had to be made simpler for the cook who knows only Indian cooking. And she did a good job with this potato, spring onion and quinoa salad, though I had to monitor it closely for the first time. Cooking with quinoa everyday in an Indian kitchen can be tricky as it is a fairly new ingredient for India. Most people I see replace the everyday rice with quinoa or make khichdi with it but I wouldn't like to disturb my comfort meals of rice and lentils, dal chawal as we call it. 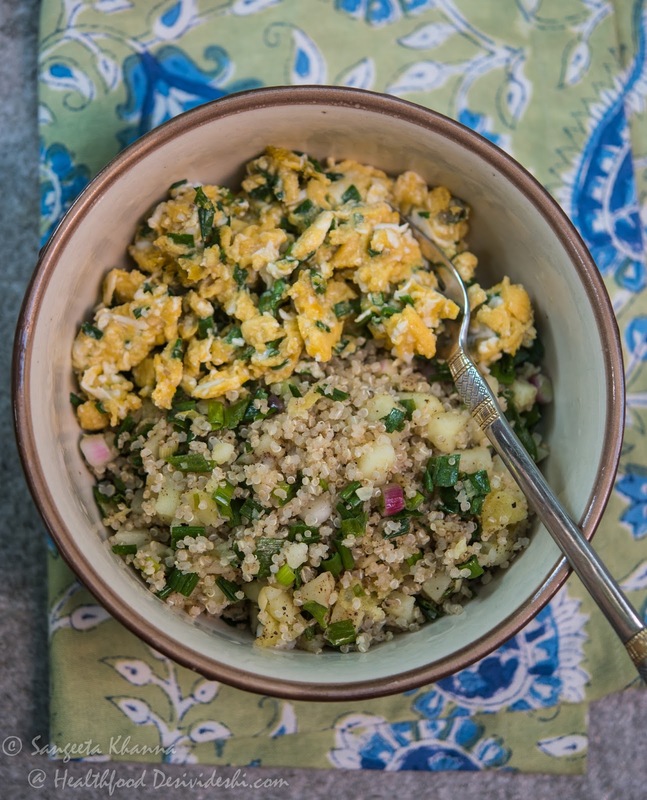 The best way to absorb quinoa into any cuisine is to create recipes that have a signature element of the cuisine, so it retains the everyday appeal and yet doesn't step over the comfort foods one has identified with for generations. And since quinoa is almost bland tasting grain and takes any flavours easily, it gets easier to play with the flavours we want it to soak into. Salads have been my preferred choices for quinoa, something that keeps the grain's individuality and yet flavours it in my favourite ways. This carrot walnut raisins and quinoa salad has been a regular and another with roasted beets and pumpkin is yet to be shared. But we need variety, we have been eating quinoa almost 5 days a week recently, could easily get bored if it was the same everyday. Moreover, I need recipes that the cook can understand and execute the way I want it. 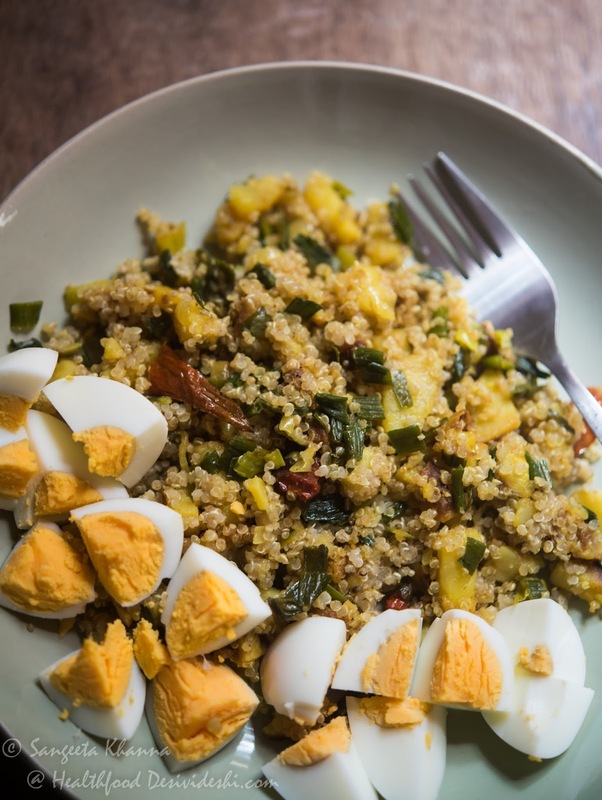 Some of these Indian subzi inspired quinoa recipes are handy these days. Heat the oil or ghee and tip in the potatoes gently. Toss and mix salt. Cover and let it cook for 6-8 minutes undisturbed on very low heat. Add the chopped bulb of the spring onion, toss and mix. Cook for a couple of minutes or till the potatoes get done. Add the green parts of the spring onion, black pepper powder and stir to mix. Take off the heat and mix the cooked quinoa. Adjust seasoning and add lime juice if required, note that the taste of spring onion shouldn't get masked. Serve warm or at room temperature. We normally have some hard boiled eggs or egg scramble on the side with this. Quite filling and delicious, this kind of meal suits when you don't want snacking in between meals. Such salads are lunch box staple now as Arvind prefers light meals. I pack the half for him and keep the other half on the dining table, to be eaten without reheating. It gives me an idea how it tastes after a few hours. Trust me it is one of the best one pot meals suitable for lunch box that I have tried. I got this made with paneer as well. Just replace half of the potatoes with paneer and add the chopped bits of paneer along with spring onion greens. You might feel like adding some boiled and shredded chicken too, it can be adapted to taste really well. See how we have it with hard boiled eggs too. Adding turmeric to everything these days as it is anti inflammatory, hence the light yellow in this plate of Indian style quinoa salad. 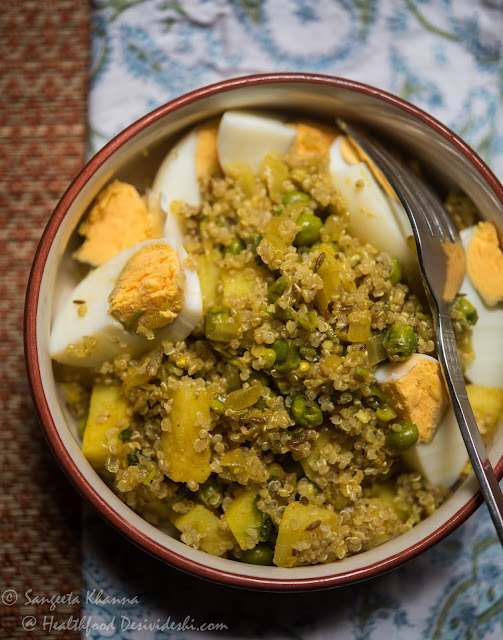 And now that the cook has got the hang of this method of making quinoa salad, I told her to make alu matar wala (with potatoes and peas) quinoa salad. This was made in mustard oil with a cumin and dry red chilli tempering. Chopped potatoes and some chopped red onions were added along with green peas. Some salt and turmeric powder was mixed in and everything was cooked together, covered on low heat for about 10 minutes before being mixed with cooked quinoa. It is this easy to incorporate our everyday comforting flavors into quinoa salads. These recipes make it suitable for lunch boxes too so I am going to make use of such combinations more and more. 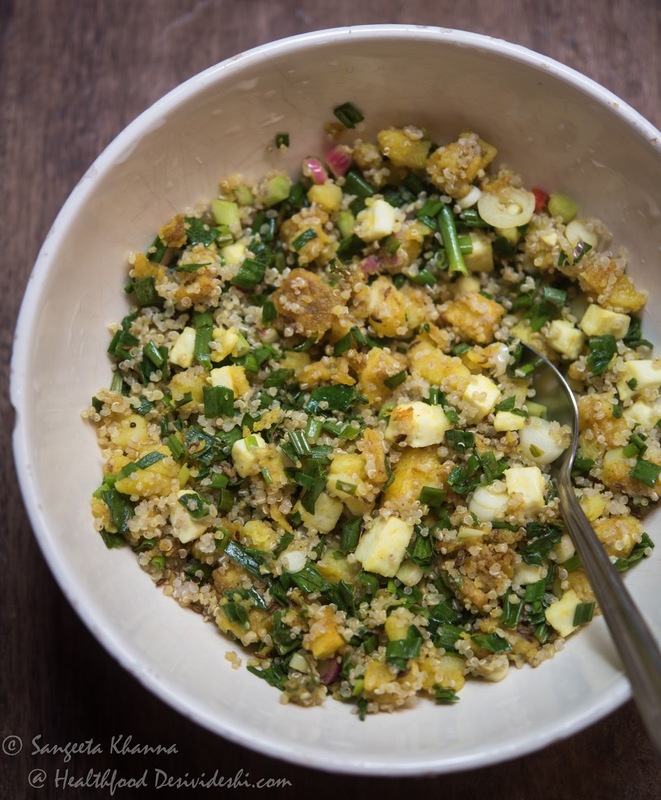 Try these Indian recipes of quinoa salads and let me know if you liked. These look great. 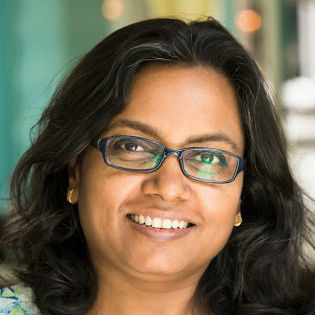 Thanks for the ideas Sangeeta! These are some really helpful recipes.love all your posts and suggestions.keep going!